I thought tabling a comicon was hard. Try promoting a comicon on the whole floor for four days! 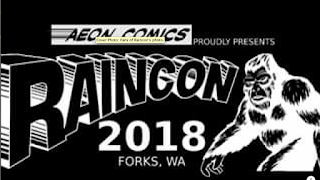 In this case, the second annual RainCon, also known as "The Sequel." 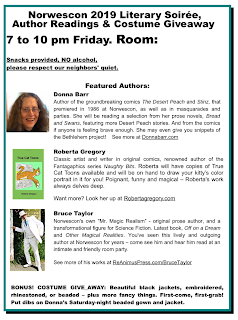 Thursday, I talked individuals into each taking one of an inch and a half of RainCon flyers. I thought I was done, but the promotion went on and on. Sunday afternoon, I was still hooking up people in the beer garden. I am now completely out of business cards. I think the show will be getting a wheelchair and "disabled" cosplay group (although I hesitate to use the word about any cosplayers, who are about as able as they come). I'm afraid I put most of the photos for this show up on Facebook, but I retained some IMPORTANT ONEs. 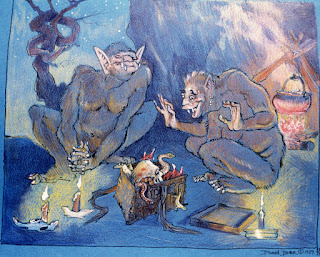 Like the college roommates in "Wicked." Here's Roberta Gregory, on the first day of the show, at our organization-and-coffee table, where we figure out where we'll be all day, just before we split up to go running around the hamster maze that is the Seattle Convention Center. Every year I have to relearn that thing. Next year, I'm planning on using this time space for San Diego Comics Fest. A lot of my old friends and colleagues are in San Diego - of course - and I need to drop in and see them once in awhile, as well as take care of my substantial and loyal fan base. Of course I'd think a picture of me in the beer superhero photo frame is important. Or funny. Northwest Press's Zan Christiansen is always good for a laugh. Here he is trying hard not to cover fellow booth babe Steve's face. We agreed that "LGBTQ" can be replaced with "BLT" in conversation, because we are tasty, greasy and salty. 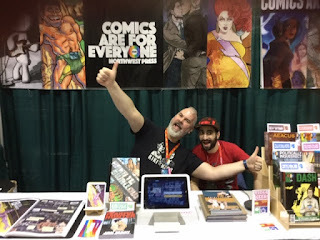 Hearing that RainCon is featuring the LGBTQ community this year, Zan made sure I had plenty of wonderful books for the RainCon comic shop dollar box. 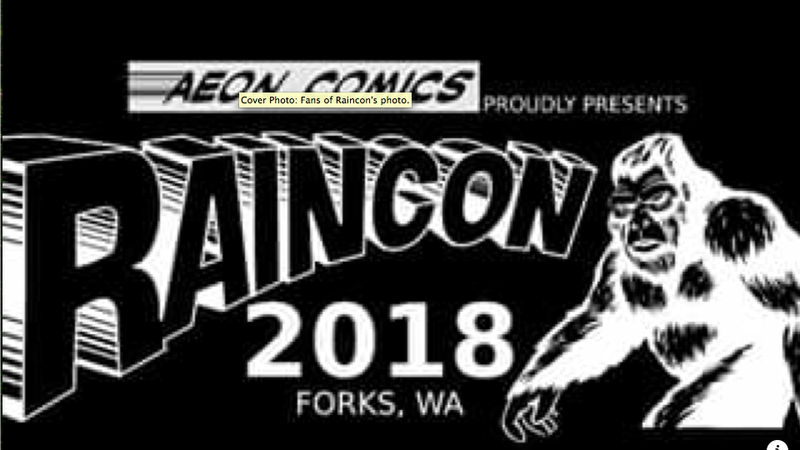 Before you think that's just being nice, we've discovered that the people in Forks - who have only ever known superheroes - will not only load up from the dollar box on authors they've never heard of, they'll show up at RainCon as a brand-new fandom for those authors. I'd very much advise contacting Evan Sveum at the Raincon website or on the Facebook Friends of RainCon pages about sending him some copies. Even dinged ones are welcome - and it's a great way to use slightly damaged product. At a $1 a pop, the fans will grab them. 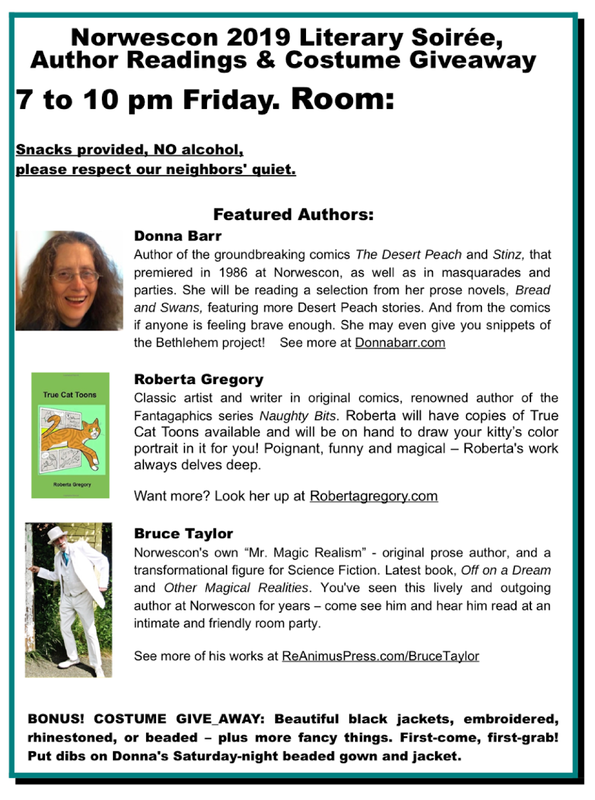 Roberta Gregory and I had some good rest times when we could have something to eat and a beer. Like at Pequinoes, a nice Mexican place in Seattle. I don't think I've ever had better nachos. The IPA and Ale went down nice, too. A good break after running around ECCC all day. 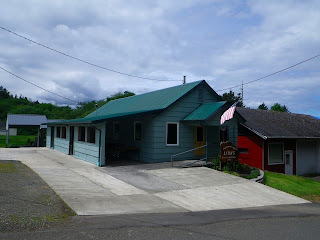 We even got around to the WildRose, Seattle's wonderful lesbian bar - and one of its oldest drinking-and-eating buildings of any sort. And look at the brand-new mural! It's so pretty, I have to use mine, too. With others posing before it. 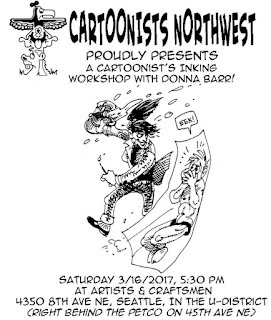 I'll be at Cartoonists Northwest during the 2019 Emerald City Comicon. 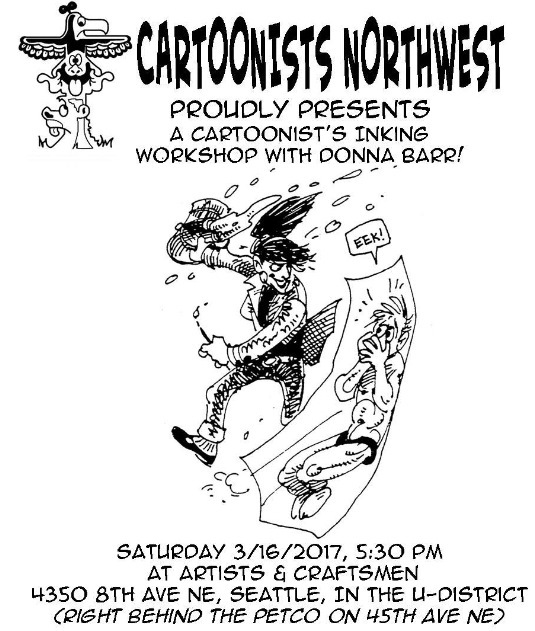 Saturday, March 16, 5:30 pm, at Artists and Craftsmen Store, 4350 8th Avenue NE, Seattle, in the U-District (right around the Petco on 45th Ave. NE. We plan to lay down a big piece of butcher paper of such, and have me draw all over it. SO YOU CAN JOIN IN. Once I get it started, you'll have an opportunity to draw your characters interacting with my Bethlehem folk. Will it be the end papers of the comic? We shall see. First of all thanks to the ShortRun staff. Their on-floor map included a tribute photo to dear Mark Campos, whom we lost under such tragic circumstances this year. They know what they're doing, and this just gets better and better every year. Wearing my Ka-Blam tshirt for my $10 printing bonus! Best POD company going for floppies, especially. Secondly, thanks to The Stranger for advising the attendees to bring CASH and loads of it. The books and other goodies FLEW off the tables. Yes, we all have Square, and yes, it works offline, but comics is comics - and you know what we run on. We'll bring a wad of Washingtons if you'll bring a wad of Jeffersons, and we'll swap. Valierie Niemeyer made a great show pal. She and her mom were so much fun and so full of energy. Her mom came with snacks! And Valerie's work is lovely. Especially her skeleton unicorn, just right with Halloween and Day of the Dead just behind us. What can I say? 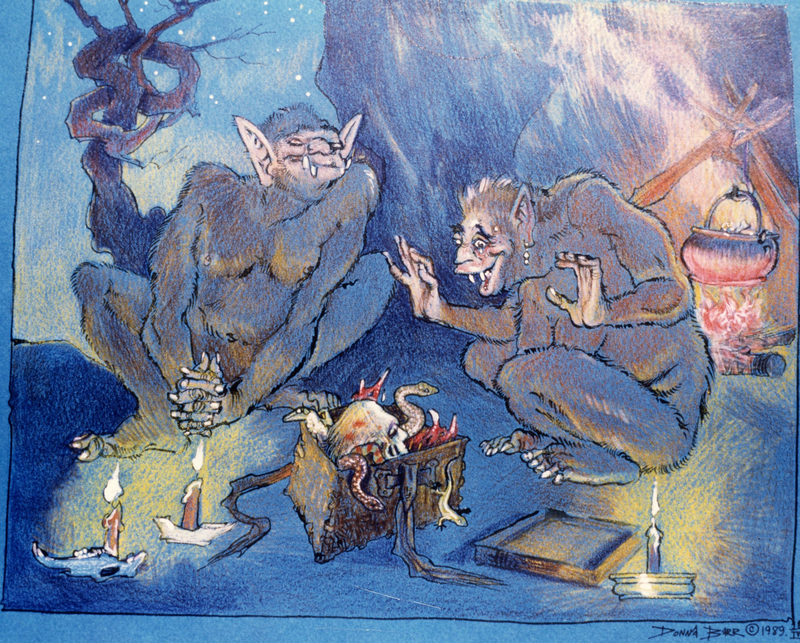 ShortRun is one of the best comics conventions anywhere. It's small - crammed into the Seattle Center Flag Pavilion - and more and more of us are buying a quarter table, just to get some space. The show when it was just getting started. The Fantagraphics Store party was great, as always, thanks to Larry. Even better. Carol Tyler was there to celebrate her new book about growing up with the Beatles - and led a singalong that reminded us just we all knew just where to say "OOOOH" and go up the scales. Missed the Vera party - but am going to schedule my trip better next year, so I'm up for it, instead of falling apart. I can't guarantee I'll get a table space next year, but signs are good.